Systems Theory has been around since the 1940's. Ludwig von Bertalanffy and Ross Ashby were both founders of what is referred to as General Systems Theory. 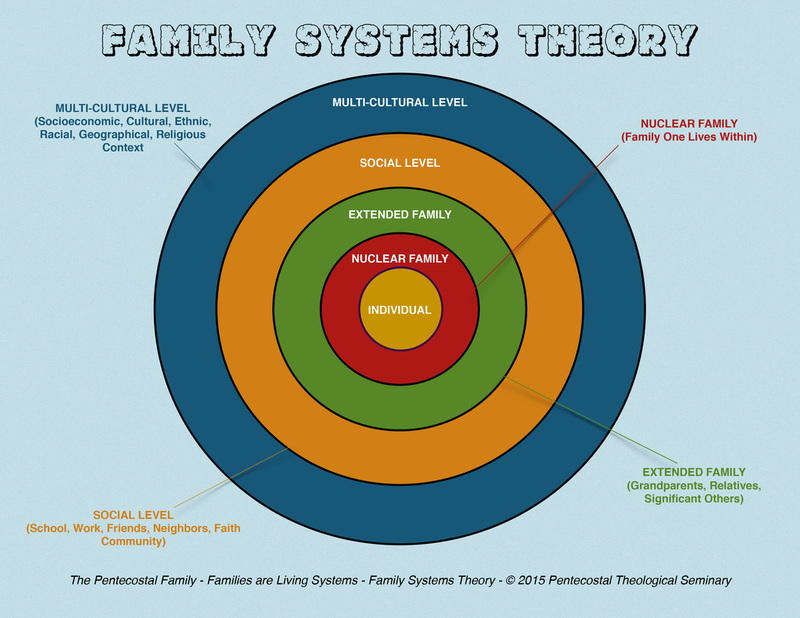 However, "Family Systems Theory", was introduced by Dr. Murray Bowen in the 1950's. This theory suggests that a person cannot be understood in detachment from others, but rather as a part of the family they are connected to, because the family is the affecting factor to the person's life. Families are the systems comprised of individuals attached to and mutually connected to other individuals, none of whom can be known in solitude from the system. Individualism has become a major trend in our society today. The focus has turned to satisfying the desires and needs of the person as an individual rather than how that individual's choices may impact or affect others. But in a family system, family life is not just a compilation of the actions of all individual members but rather a result of the interactions of all family members working as a single entity made up of interconnected parts. In other words, the Individual is described in the context of their relationship with members of their family. What is a family-systems perspective? According to, Jack and Judith Balswick, "it is a holistic approach that understands every part of family life in terms of the family as a whole." The Balswicks explain that, in other words, the family system is a system in which day to day operations are run by individuals who are interconnected. To understand any system one must begin by identifying the various levels within that system. As demonstrated in the Family Systems diagram above, there are multiple levels that make up the family system, and each level is related to the next. The individual is part of the nuclear family, which is part of the extended family, which is connected on the social level to others at school, work and other parts of their community, which is related to the broader multi-cultural level. 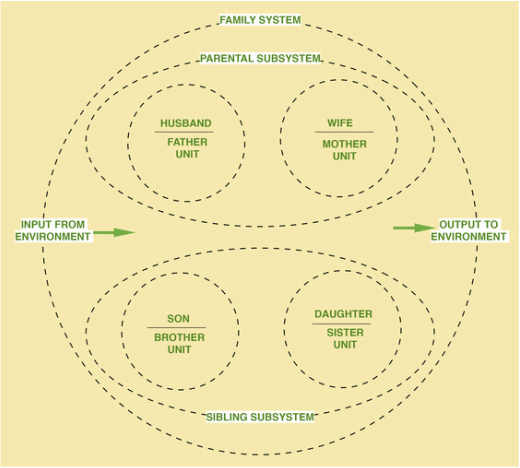 The second diagram is a representation of the boundaries that affect the Family System. Anything within the boundary is considered part of the system, and anything that exists outside the boundary is identified as part of the environment. Input is defined to be any message or stimulus that comes into the system from the environment. Output includes any message or response from the system to the environment. Family members control the pliability of these boundaries. If the family system is open, information can flow freely into and out from the family system. If the family system is closed, the family constructs barriers to limit this interaction. Additionally, a family with children has at least two subsystems, the parental subsystem which is made up of the parents and a sibling subsystem which is made up of each child. It also should be noted that those these subsystems are interrelated, each individual has their own unique characteristics, personality traits, talents and abilities, all contributing to the makeup of the entire family system. Balswick, Jack O.; Balswick, Judith K. (2014-05-06). The Family: A Christian Perspective on the Contemporary Home (p. 24). Baker Publishing Group. Kindle Edition. Historically, we are able to compare Family Systems in post-modern cultures and how they relate to modern culture of today. The Judaism Family System Model displays the role of hierarchical structure differently from that of the Greco-Roman Model, in that the families are interconnected into clans and clans are collectively joined to form a tribe. This model shows a system, though independent to itself,is reliant to other families, jointly interacting to form the tribe. Basically, independent families connected to other families formulate a system of community and stability founded within the whole system. The Judaism Family System was grounded in kinship. The term "Kinship" is referred to as one blood flowing through the veins of the kinship group. We can find a "Covenant" interaction in this model. The Greco-Roman Model displays a completely different system in that everything is contingent upon and subject to the control of the "Father" of the house. In this model, the father is fundamentally the absolute authority, in that family members are solely dependent upon, not to the community, but the father of the home. The Latin term "familia", does not necessarily refer to the nuclear family but to all persons under the legal power of the male head of the family or the "paterfamilias". This Roman model of family really did not mean family but a better interpretation would be "the household". The father has the authority to determine whether his child lived or died. He had the legal power to receive or reject his newborn infant. The father could also sell his children into slavery or even banish them. In contrast with family systems today, this would be considered barbaric at best and completely unacceptable. However, it is offered as an illustration of the cultural differences between some historical models of family systems and family systems that exist today. For more information on Family Systems, please visit the "Resource" page to find articles and web sites related to this subject.